Have you ever wondered what effects optical illusion can have on architecture? Well, there are some simple and specific things designers can do to alter the perception of interior spaces. Things like color, lighting, interior element placement, integrated (horizontal or vertical) lines and even mirrors can have a huge impact on the size, proportion and mood of a space. I came across the article entitled Interior Design Optical Illusions (1) where specifics are explained about how to manipulate color, style, lighting and mirrors into the design of a room to actually change its perceived qualities. It is interesting that such changes can alter interior spaces subtly or boldly, depending on how you design them into the space. Over time, occupants often want to change a room to accommodate new functional requirements. It is nice to know that there are ways to do this — “gain” square footage or “perceive” different moods. With understanding into how the human visual system works, designers can create a great variety of different room feels. You will be able to truly achieve great effects (for both interior and exterior spaces) by combining your knowledge of perception with your knowledge of design. 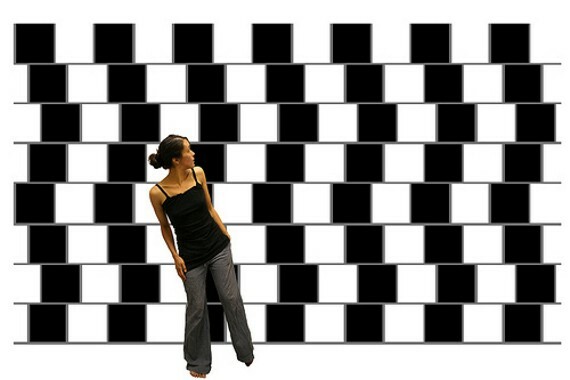 (1) Interior Design Optical Illusions. Womanknows.com. August 5, 2009.